Karma, Inner strength & Life Itself. Whenever you act selfishly, your heart feels tight, but when you try to really help others, psychologically you experience openness and a release that brings calm and understanding into your mind. To over-simplify, according to even normal society’s way of thinking, anything you do dedicated to the benefit of others is automatically positive, whereas anything you do just for your own benefit automatically brings a negative reaction. That is positive; that is good karma. However, if you don’t actively check your motivation, you might think or say the words, “I’m working for the benefit of others,” but actually be doing the opposite. For example, some rich people give money with the idea that they’re helping others but what they really want to do is to enhance their own reputation. Such giving is not sincere and has nothing whatsoever to do with positive action or morality. Giving with the expectation that others will admire you is giving for your own pleasure. The end result is that it makes you berserk, restless and confused. Check up. Look at the way normal people act; it’s so simple. Even if you give away huge amounts of money, if you do it with selfish motivation, expecting tremendous results for yourself, you end up with nothingness. It’s a psychological thing; there’s more to giving than just the physical action. Take me, for example. I can sit cross-legged in the meditation posture and you’re going to think, “Oh, Lama’s meditating.” But if my mind is off on some incredible trip, although it looks as if I’m doing something positive, in fact I’m doing something completely neurotic and confused. You can never judge an action from its external appearance; its psychological component is much more important. Therefore, be careful. In particular, acting out of loving-kindness doesn’t always mean smiling, hugging and telling people, “Oh, I love you so much.” Of course, if that’s what somebody needs, then go ahead and stroke or hug that person; I’m not saying that you have to give up all physical contact. You just have to know what’s appropriate at any given time. I say, “You want to go? Oay, go and try to help as best you can.” So they go, full of emotion, and, of course, see terrible suffering; poverty, starvation, disease and so forth. After a month, they have to leave, exhausted, because they find that simply going there, trying to help, isn’t really the solution. A couple of my students, beautiful young women, went to Pakistan and Calcutta, hoping to express their loving-kindness through serving where suffering was greatest. I told them to go, and return when the time was right. When they got there they discovered that what they were doing wasn’t really helping, and it wasn’t long before they were back. Actually, expressing loving-kindness through action is quite difficult. You have to be very skillful. It takes great wisdom. If you set out on a mission with no understanding, just a tight, emotional feeling of wanting to help, you’re in danger of losing yourself. For example, if you see somebody drowning and emotionally jump in without being able to swim, all that happens is that you both lose your lives. Our physical energy is limited. Therefore, we’re limited in helping others in this way—we try to help others physically but come up empty; it’s beyond us. If you do want to help others out of loving-kindness, act according to your ability and know your limits. Don’t overburden yourself because of emotion and incomplete understanding. When we practice Dharma and meditation, we build the inner strength necessary to be of greatest benefit to others and are able to face any difficulty that arises. Practitioners who are afraid to hear about suffering aren’t facing reality. The maha in Mahayana Buddhism means “great.” A Mahayana practitioner is supposed to be capacious and, like a ship, be able to take whatever comes along. If we’re small-minded and hypersensitive, even tiny atoms can cause us to recoil: “I don’t want that atom.” That’s not the way of the Dharma practitioner. Even the average, simple person who wants his or her life to be successful should be able to face whatever situation arises. If you freak out at the smallest thing, you’ll never make even this life successful. Everyday life is completely unpredictable; you can’t fix things to work out in a certain way. As things change, you have to change with them. You have to be flexible enough to deal with whatever happens. If this is true for the ordinary person, how much more true must it be for the Dharma practitioner? 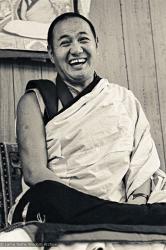 You have to have the courage to face any difficulty that you encounter: “I can overcome any obstacle and reach perfect liberation.” Crossing the ocean of samsara is not easy, but it’s not samsara that’s difficult—it’s your own mind. What you actually have to cross is the ocean of your schizophrenic mind and you need to be confident that you can deal with that. First you have to be able to think, “I can face whatever comes without running from it.” Life is not easy; forget about meditation—life itself is hard. Things change; the mind changes. You have to face each change as it comes. Going into retreat doesn’t mean that you’re running away from society and life because you’re afraid of them. However, you need to develop confidence that you’ll be able to handle anything that life throws at you. What you really need to judge, though, is what the most advantageous thing to do at any particular time is: to stay in society or go into retreat. Whatever you undertake is in your own hands; what you need to know is why you are doing it. 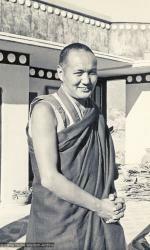 Lama Yeshe gave this teaching at Chenrezig Institute, Australia, 28 June 1976. 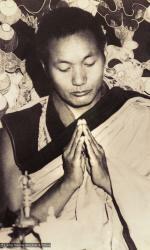 Edited from the Lama Yeshe Wisdom Archive by Nicholas Ribush. 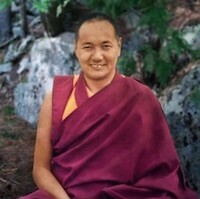 Read more of Lama Yeshe’s teachings at Lama Yeshe Wisdom Archive. 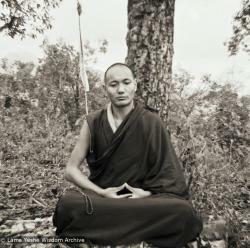 Total Openness: The Wisdom of Non-duality. Images: 1 by Carol Royce-Wilder, 2 by Max Matthews, 4 by Adele Hulse. Also see more about Image 3. A genuine article about mindfulness and so few responses. Hmm… I think this is a must read for people who are genuinely on the path. No advice to the love-lorn , just real talk about real expansiveness. This was a wonderful share. I felt my mind open just that much more. Thank you.